With over 30 years in the driver training industry we really hold the key to passing your driving test! The most experienced driver trainer specialist in Norfolk. We offer high quality driving lessons and trailer training (B+E) in Norwich and it’s suburbs, plus many of the outlying towns and villages in Norfolk – E.g. Cromer, North Walsham, Hethersett & Wymondham. 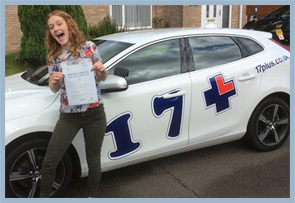 All 17 Plus driving instructors – both male & female – are selected for their professionalism and patience. They are fully qualified DVSA approved and many hold advanced driving or fleet training qualifications. Take regular weekly lessons – 60, 90 or 120 mins – & increase your chance of a FIRST TIME PASS. Learn to drive in a shorter period of time – in the most flexible way! a structured tuition plan making learning easy and enjoyable. Would highly recommend Malcolm at 17 Plus, he was very patient but also honest which really helped me achieve my goal of learning and passing over my summer holidays. Very professional but also friendly and made me feel comfortable behind the wheel. Thank you! Thank you to Ashley who taught me the skills that enabled me to pass my practical test first time. Your invaluable experience helped me feel at ease and confident when achieving this. Look no further for a great instructor. Once again thank you so much Ash and 17 Plus. As an older driver I wasn’t looking forward to the lessons to be honest! But Vladimir was a very calm, clear and encouraging instructor. I felt I was accessing a lot of experience and someone who really understands how people learn new skills. 17 Plus made it a very smooth journey.